After a successful freshman campaign that concluded with qualifying for the 2018 3A State Track and Field Championships in three events, including a sixth-place finish in the 400-meter run, Gervais sophomore Katie Hanson is looking to roll it all back again in 2019. The multi-tooled athlete burst onto the track and field scene as a freshman last year, punching her ticket to the 3A state meet individually in the 400 and 200-meter runs in addition to joining teammates Judith Santos, Mary Davidson and Ashley Marin Vallejo in the 4x100 relay. This year, with the Gervais School District moving from 3A to the 2A Classification, Hanson could make a run at even more events this spring after strong outing in her second competition of the season. Hansen led the Cougars to a third-place finish at Molalla High School's Heckard Field in last week's MidValley MatchUp on March 21. Though Hansen did not take part in the 400, the event in which she experienced the most success a year ago, she took the top time in the 200 with a season-best finish of 27.65. Despite the rain-slicked track, Hanson nearly matched her personal record of 27.53 from last year and cruised to a relatively easy victory, finishing two seconds ahead of runner-up and teammate Mary Davidson (29.64). Davidson and Hanson later reunited with Santos and Vallejo in the 4x100, together taking second place with a time of 1:01.54. In the field, Hanson added a pair of top-five finishes in the long jump and triple jump, two events in which she competed sparingly as a freshman. Hanson placed second in the long jump with a distance of 14-09.75 and took fourth in the triple with a mark of 29-09 — both personal bests. Elsewhere for the girls team, Davidson added a second-place finish in the shot put, marking a distance of 28-08 that was just behind the PR of 29-04 she set five days prior at Jefferson High School. Davidson also led the Cougars in the 100, placing fourth with a season-best time of 14.08. Vallejo joined Davidson in the runner-up circle in the throwing events, placing second in the discus with a PR-mark of 76-02, an improvement of more than 10 feet over her freshman-year best. Fellow sophomore Anessa McCarroll took home another second-place finish for the Cougars in the 800 with a PR-time of 3:03.60. McCarroll added another PR with a fourth-place finish in the 1,500 (6:49.41). Rounding out the team's top finishers was sophomore Araceli Vasquez, who placed third in the javelin with a distance of 92-04. Vasquez was coming off a personal-best distance of 98-09.50 a week before at Jefferson. On the boys side, the Cougars were led sophomore runner Brian Limage, who is looking to make strides this season as a strong contender for the state meet in the mid-distance events. Limage placed sixth in the 400 at last year's PacWest District Championships and eclipsed that time by nearly two seconds in his season-opening meet at Jefferson with a second-palce time of 54.39. The Gervais sophomore eschewed the 400 at Molalla in favor of the 800 placing third with a time of 2:21.23. Limage teamed with Auggie Guido, Rolando Miranda and Alann Ojeda to post a fourth-place time of 4:18.41 in the 4x400 relay, and likewise finished fourth in the 4x100 relay with teammates Fabian Santos, Carlos Guzman and Jack Reinwald (51.98). Elsewhere, freshman Daniel Chernishoff made his debut in the 3,000, placing third with a time of 12:41.19. He added a sixth-place finish in the 1,500 with a PR-time of 5:39.28 as he looks to fill the role of Gervais' top distance runner this season. Another freshman, Francisco Cobos, led the Cougars in the sprints, placing 13th in the 100 with a PR-time of 13.44. In the jumping events, Guido led the team with a PR-mark of 14-02.5 in the long jump and a sixth-place finish of 4-10 in the high jump. 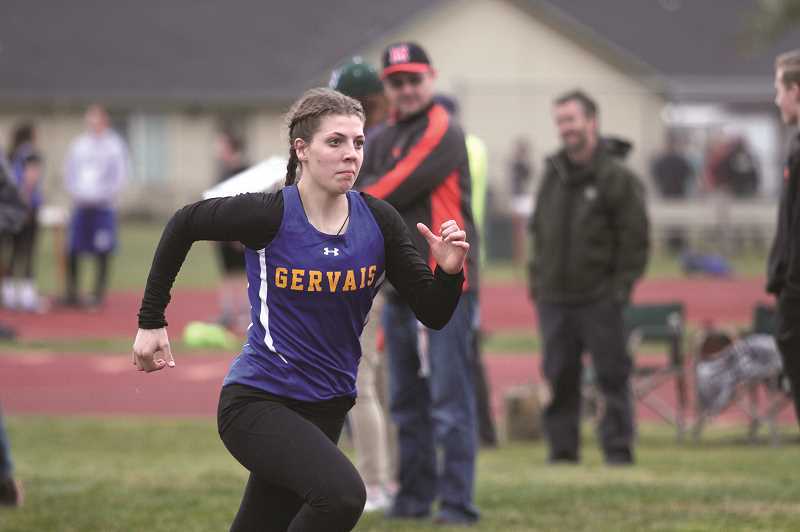 Gervais is scheduled to compete this week at the Canby All-Comers Meet and returns to league action on April 4 at Colton High School.